A quick personal note, an update on my move from Olathe to Iola: we’re pretty much moved in to the new house now, though we’re still making frequent trips back to Olathe to deal with work on the old house. It’s been a busy couple months, and my time for working on Kansas Cyclist, and my other web sites, has been limited. Sorry that updates here have not been as frequent as normal, and that I’ve not been able to cover some stories as much as they deserve. Hoping to get caught up in the near future! My original “Moving to Portland (Alley)” article had apparently been widely shared in Iola, and the newspaper wanted to follow up on that. 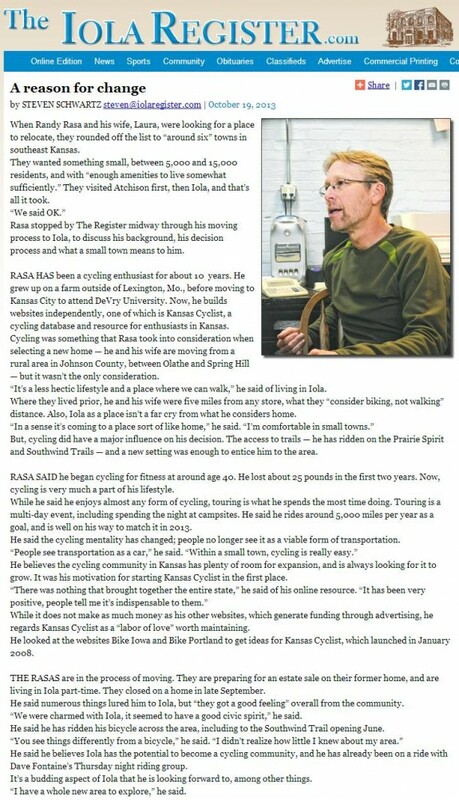 The interview covers a bit about our motivations for moving, and for choosing Iola, and a bit about my background and about Kansas Cyclist. Incidentally, the Iola Register is a rather amazing story itself. It’s published 5 times per week, with solid in-depth coverage of Iola and the surrounding area. A strong press is a very important asset for a community, and I think that their publishing schedule is pretty impressive for a small-town newspaper.